We’d love your help. 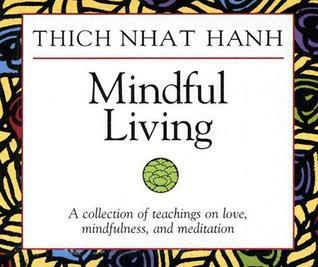 Let us know what’s wrong with this preview of Mindful Living by Thich Nhat Hanh. To ask other readers questions about Mindful Living, please sign up. There are 3 cds in this set. I was not overly impressed with Touching the Earth and gave it only 3 stars. Teachings on Love, however, blew me away. Definitely worth 5 stars! Truly, if more people were to approach their relationships with the kind of compassion and honesty that Thich Nhat Hanh encourages, fewer people would ever get married. To be this transparent and vulnerable requires a great deal from both people in the relationship and love, true love whether romantic or platonic, rarely asce There are 3 cds in this set. Teachings on Love, however, blew me away. Definitely worth 5 stars! Truly, if more people were to approach their relationships with the kind of compassion and honesty that Thich Nhat Hanh encourages, fewer people would ever get married. To be this transparent and vulnerable requires a great deal from both people in the relationship and love, true love whether romantic or platonic, rarely ascend so high. The Art of Mindful Living is also very good. Anyone familiar with Thich Nhat Hanh's teachings has probably heard this all before but hearing a truth reiterated doesn't lessen the merit of the teaching. This was a collection of recordings of his from workshops, retreats, etc. and it was soooo great to hear it in his voice. Many practical exercises, especially in the crazy busy lives of American - some of which I am using already. For example, viewing red lights as an opportunity instead of a frustration or inconvenience. Take each red light as a chance to connect with breathing and a moment to mediate and be in the present moment. I have always loved his work, but I had no idea he was so funny. This was a collection of recordings of his from workshops, retreats, etc. and it was soooo great to hear it in his voice. Many practical exercises, especially in the crazy busy lives of American - some of which I am using already. For example, viewing red lights as an opportunity instead of a frustration or inconvenience. Take each red light as a chance to connect with breathing and a moment to mediate and be in the present moment. Super interesting. I wish everyone would listen to these talks. It might make the world a better place. I would love to see him in person.